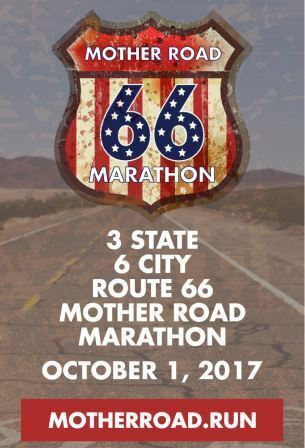 Round trip transportation to the Mother Road 66 Marathon - Bus fare only, riders are responsible for their hotel reservations. **Hotel group code will be in your bus registration confirmation email and room must be book before 9/15. Bus departs OKC Sat. Sept. 30 around 1pm (park at NW 122nd/I-35 communter pkg. lot) to Joplin, MO for a race packet pick up, dinner at a nearby restaurant (probably the Olive Garden) and then to the Hampton Inn - Joplin to stay the night. Early Sunday Oct. 1, the hotel will provide a continental breakfast at 5am then we depart around 5:45 am on the bus to drop off the full marathoners and 5k'ers at the start line near Commerce Street. The bus will then take those running the half marathon at their start line before 7am, about 1 mile north of Baxter Springs, Kansas. The bus would then meet us at the finish line just west of Joplin, MO. Bus will depart Joplin around 1:30 pm to head to OKC, arriving home around 5pm. The race will provide shuttle service from the finish line to the host hotel where we are staying. We have a late check-out at 1pm on Sunday if anyone wants a shower. Group rate $109/night per room (a block of rooms is being held for our group until 9/15, 2 double beds is all that is available). Race is offering $5 off for the half marathon, $10 off the marathon - good until 9/30. You may stay some place else but the bus will not drop off or pickup at other locations. **Race starts at 7am, bus leaves at 1:30pm so you will need to complete your race no later than 12:30pm to be at hotel ready to leave by 1:30pm.